^ Hulett, Steve. Splashing Around the SPA. The Animation Guild Blog. 2011-04-05 [2011-04-06]. ^ Sony Pictures Animation. Check Into Sony Pictures Animation's Hotel Transylvania At Comic-Con International: San Diego 2012. PR Newswire. July 9, 2012 [July 10, 2012]. ^ Mark Mothersbaugh to score ‘Hotel Transylvania’. Film Music Reporter. January 27, 2011 [May 12, 2012]. ^ Hotel Transylvania. TIFF. [July 31, 2012]. （原始内容存档于2012年9月5日）. 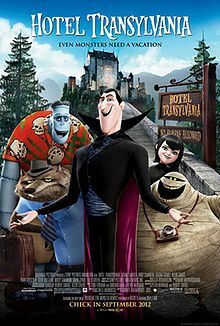 ^ 5.0 5.1 Hotel Transylvania. Box Office Mojo. [September 28, 2012].